The Sundays are counted as the Sundays after Trinity Sunday, which gives them a sense of continuity as we get on with the routine daily tasks that make us partners with God in the Creation. Summer is beginning to break through, and while farmers are busy in the fields, the holidays are about to begin for many others. 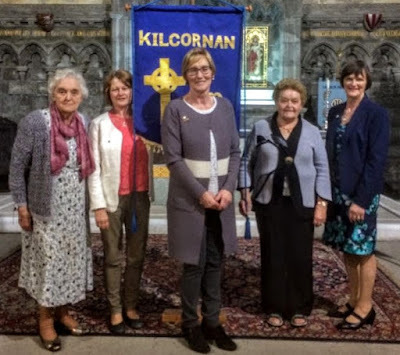 Sunday 3 June (Trinity I): 9.30, the Eucharist (Holy Communion), Saint Mary’s Church, Askeaton; 11.30, Morning Prayer, Saint Brendan’s Church, Kilnaughtin, Tarbert. Sunday 10 June (Trinity II): 9.30, the Eucharist (Holy Communion), Castletown Church; 11.30, Morning Prayer, Holy Trinity Church, Rathkeale (with the Revd Joe Hardy). Sunday 17 June (Trinity III): 9.30, Morning Prayer, Saint Mary’s Church, Askeaton; 11.30, the Eucharist (Holy Communion), Saint Brendan’s Church, Kilnaughtin, Tarbert (with the Revd Joe Hardy). Sunday 24 June (Trinity IV and the Feast of Saint John the Baptist): 9.30 a.m., Morning Prayer, Castletown Church; 11.30, the Parish Eucharist (Holy Communion 2), with Baptism, Holy Trinity Church, Rathkeale. 5 p.m., Saint Mary’s Church, Askeaton, Choral Evensong with the Choir of Saint Mary’s Cathedral, Limerick. Saturday 23 June: the Diocesan Synod, Villiers School, Limerick, 10 a.m. to 4 p.m. The parish branch of the Mother’s Union is visiting the gardens of Tommy and Valerie Downes, including afternoon tea, on Saturday 23 June at 4 p.m.
Congratulations to William and Karen Langford on the recent birth of their baby daughter, Chloe Dorothy. William is from Kilcosgriff, Shanagolden, and the family now lives in Dublin. The death has occurred of Sheena Lynch (nee O’Sullivan), Main Street, Askeaton, who was buried in Saint Mary's Churchyard, Askeaton. She is survived by her husband Albert (formerly of Castletown, Pallaskenry), daughters Brid and Ailish and son Robert. Patrick recently took part in the end-of-year services in Coláiste na Trócaire, Rathkeale, and Coláiste Mhuire, Askeaton, and was the guest speaker at the launch of The Preacher and the Prelate, the new book by Patricia Byrne, in O’Mahony’s Bookshop, Limerick. The is an edited version of the Parish Notes for the Rathkeale and Kilnaughtin Group of Parish in the June 2018 edition of ‘Newslink’, the Diocesan Magazine for the Dioceses of Limerick, Killaloe and Ardfert.